The Parental Controls Tool in your Linksys cloud account allows you to restrict Internet access for users within your network. This feature lets you control which of your children’s gadgets are allowed to access the Internet on specific times. This article will guide you on how to restrict Internet access on specific times in your network through your Linksys cloud account. NOTE: If you would like to restrict Internet access on specific devices using your Linksys cloud account, click here. Click Parental Controls on the left panel. Toggle the slider switch to the ON position then select the device that you want to restrict access from the Restrict Internet access on list. NOTE: Make sure that the Parental Controls Tool is switched ON. If this Tool is OFF, the list of devices will be grayed out. Select Specific Times in the Block Internet access box and click Edit. NOTE: This option is not available if viewed on mobile devices through the Linksys app. The app will only allow you to block Internet access by setting Never or Always and by typing Specific Sites. 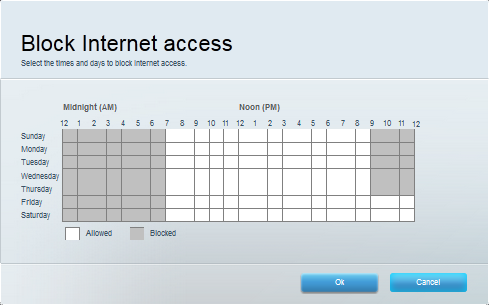 Click a square or several squares that represent the time of day you want to restrict Internet access. QUICK TIP: To select multiple square rows or columns, hold down the left button on your mouse and drag the cursor up and down or left and right. You will see a red dash when dragging your mouse to select multiple boxes but will be replaced with gray squares once you stop holding down the mouse. NOTE: Gray boxes denote Internet access is restricted on that time. Once done, click Ok to set the times and days you want the Internet access to be blocked. Click Ok at the bottom of the Parental Controls window to save your changes. You have successfully set the Internet access restrictions on your router. The device you selected for this restriction will now be listed on the Parental Controls widget of your Linksys cloud account.